I had two nightmares last night. In one, Ducati’s draXter XDiavel concept was chasing me down a dark, desolate highways and trying to eat me. The other involved losing a bet and being strapped to the draXster with the throttle taped wide open as someone dropped the clutch. I still can’t decide which was scarier. 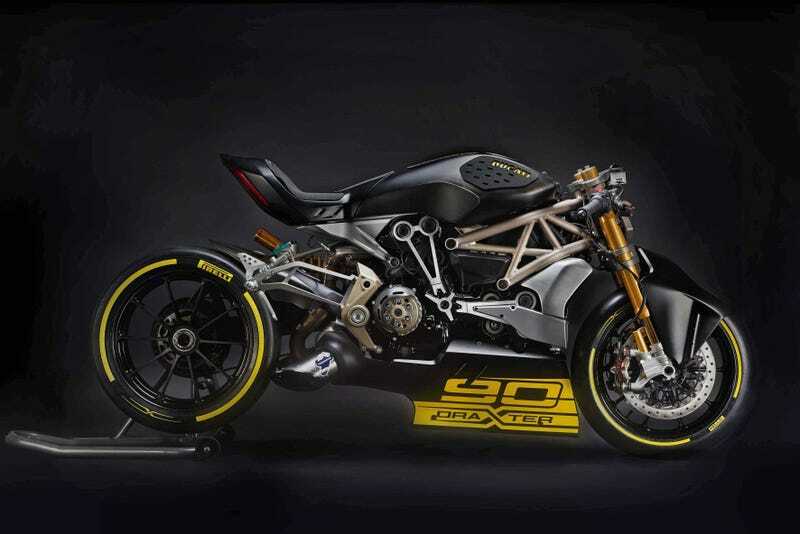 Ducati unveiled the draXter at the Motor Bike Expo in Verona, Italy, and was created by Ducati Design Center’s Advanced Design team. It fits the suspension and brake components from the Panigale Superbike to the standard XDiavel, as well as a dry-clutch conversion kit and some stunning down-turned Termignoni pipes. Then there’s those clip ons and that massive Pirelli read slick. Ducati said the draXter concept is a “sporty” take on their Diavel... which is supposed to be a “sporty take on a cruiser.” The 90 on the side is to represent 2016 being Ducati’s 90th anniversary, even though only produced radio components until the 1940's. Regardless of some oddball logic, I think this bike looks absolutely gorgeous—even if I have no desire to ride it. I’m headed to San Diego today for the press launch of the non-nightmare version of the thing, the actually awesome-looking new Ducati XDiavel and you can bet I’ll be trying to picture it with those pipes and bars the whole time. Yes, another launch and yes, I plan to suit up. No, I haven’t unpacked in weeks or done laundry and no, I didn’t forget about your Zero or Husqvarna reviews. Some day, these brands will learn to not plan all of their launches on top of each other.